Without some sort of accident or trauma it can be tough to tell exactly why someone’s spine has become subluxated, but there are a few usual suspects. Trauma is the most obvious. When a patient comes in complaining of a neck pain following a car accident it is fairly cut-and-dry. When someone just “wakes up” with pain one day the cause becomes more difficult to ascertain. Usually it then comes down to repetitive motion, a posture issue, or a combination. Another factor to consider is unresolved traumas that have then been subject to repetitive motions. For example, if you were involved in a car accident and your head whipped forward, it is extremely likely that your spine became subluxated. In fact there is 100% chance that a misalignment has occurred. 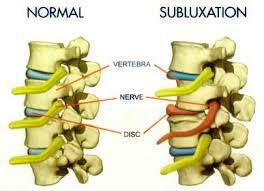 If that subluxation goes uncorrected for a number of years it will start to cause degeneration. Top that off with sitting all day at a desk job, texting, and any other repetitive motion that is detrimental to the spine and you have your cause. An accident or trauma is considered a macrotrauma, but don’t underestimate the power of the microtrauma (repetitive motion/postural abnormality) to reek havoc to the spine and nervous system as well. “Sitting is the new smoking” is one phrase that sums it up fairly well. The flexed forward posture is terrible for your spine and should be avoided as much as possible. The smart phone has thrown yet another forward flexed position into our daily lives, and many Chiropractors are predicting that the current generation will have more neck and back problems than any previous generation. In all honesty, the cause of subluxation is more likely to be a combination of everything that I have mentioned in this post. Some form of trauma that has gone uncorrected, repetitive motion, and postural issues. Chances are you did not just “wake up with a crick in your neck”, chances are it has been moving into that subluxated state for a long time. The morning that you felt the pain for the first time was just the straw that broke the camel’s back…or neck as the case may be. The best way to avoid pain in your spine is to get yourself checked on a regular basis by a Chiropractor. Don’t underestimate small car accidents or falls that produce any sort of pain. It is best to get checked to ensure that you are not walking around subluxated. This entry was tagged chiropractor. Bookmark the permalink.